The booming of propane run air cannons in the vineyard are a sure sign harvest is close to being in full swing. The cannons are used in many vineyards to scare away the birds when the grapes ripen. Some vineyards put nets over their vines to keep the birds out and often that occurs when the wineries are making ice wine as these grapes need to stay on the vines well into the winter. But birds are not the only creatures that love the taste of ripe grapes. Deer can also be very good consumers of grapes if they get loose in a vineyard and our resident black bears can eat up a whole row in very short order. At Blue Mountain we have put an 8ft fence around our vineyards to keep the deer out and as the bears dig under the fencing we have had to electrify the fencing to keep bear damage to a minimum. All this to protect the 80 acres of grapes we are using to make our wines. In the cellar, Matt and the crew have harvested 68 tonnes of fruit to date. These Pinot Noir, Chardonnay and Pinot Gris grapes have been pressed, pumped into tank and then left to sit for 24 hours. This lets any particles settle out. The juice is then racked and inoculated with commercial yeast selected from the Champagne region of France. The majority of this juice will be fermented in tank with only about 10% being barrel fermented in older French oak barrels for approximately 3 months. The portion in barrel is to add complexity to the sparkling wine. So that completes our sparkling grape harvest. The crew gets a much deserved rest for the next three days and will be ready to go again on Monday when we start harvesting the Sauvignon Blanc for the table wine off of our Horse Thief high density vineyard for our cream label Sauvignon Blanc. A big Blue Mountain welcome and thank you to Lisa Andrews from Rogers & Co in Toronto, Ontario who is helping us this week with the harvest. The Okanagan Fall Wine Festival is fast approaching and events are selling out on a daily basis. If you haven’t already booked where you are staying and what you are attending now is a great time to make those decisions. In Okanagan Falls we are gearing up for a number of events at local wineries and in the community. We have some great guest houses to stay at in OK Falls as well the Oliver and Penticton areas are only about a 15 minute drive away. Here is an overview of some of the many events taking place in Okanagan Falls over the next couple weeks. Enjoy your Okanagan Fall Wine Festival! The first Pinot Noir grapes for our Sparkling Wine have been handpicked on this cool September morning by our amazing Mexican crew. And they look beautiful -- clean, evenly ripe, and with the needed acidity for Sparkling Brut. In the early morning hours on Thursday we started unloading approximately 49 bins of fruit, or 7.8 metric tonnes from our Horse Thief Vineyard planted in 2007. 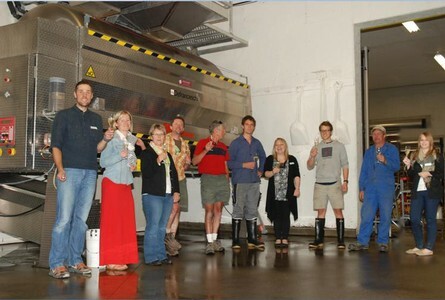 Before we started up the press all the staff gathered for a traditional toast to the new vintage, with sparkling wine of course! With Charles transporting the fruit from the field, Christoph and Felix running the forklifts, the fruit was fed into our membrane press and whole cluster pressed. The first run juice or Cuvee makes up 75% - 85% of our crush. The berry remains or pomace were returned to our compost pile and the free run juice was put into stainless steel fermenters. We whole cluster press to get minimal skin contact as these Pinot Noir grapes are destined for our Brut Sparkling Wine. We keep all the fruit separated in these tanks, not only by vineyard, but by different sections within each vineyard, while the grapes ferment. This is to try and best preserve the unique terroir of each site. Matt oversees it all; keeping everything organized by labeling the unique lots of fruit. After pressing, the juice is pumped into tank to let the solids settle. This clears the juice and prepares it to be racked tomorrow. If you come and visit us, you’ll see our bins of Pinot Noir grapes lined up where our visitors usually park, where they’ll stay nice and cool in the evenings, and be close enough to continue pressing in the early hours of the morning. Looking ahead this week we will harvest Chardonnay and a small quantity of Pinot Gris all from our Horse Thief Vineyard. These will be used to make up the blend for our NV Brut. Although it hasn’t been as long of a day as many we will face in the coming weeks, it has been a very exciting first week of vintage! Welcome back to Blue Mountain vintage veterans Charles and Felix, and for first-timer Christoph, who was very much appreciated in the cellar. The Chocolate Chip Cake was delicious and appreciated during the busy day. Thanks Jane! 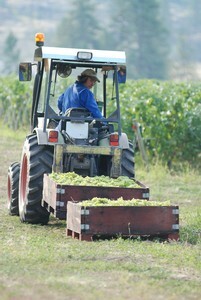 All in all it has been an excellent start to the 2012 Harvest. Every year thousands of visitors descend upon the Okanagan Valley looking for that little piece of what many of us take for granted. We live here and we can visit these places anytime but even within the valley we all have our favorites. We thought it would be fun to come up with our own list of the best kept secrets in the Okanagan. So we surveyed a few of our staff and asked them to share the best things about being a local in the Okanagan. We hope if you are here for a weekend or a week long holiday you will enjoy having a few insider tips on where to go and what to do. Favorite Place to while away an afternoon? Julie: On any of the lakes in the valley. Felix: Horseback riding in Summerland. Favorite Ice Cream flavour and where you go to get it? Favorite hill to ski or snowboard on in the valley? 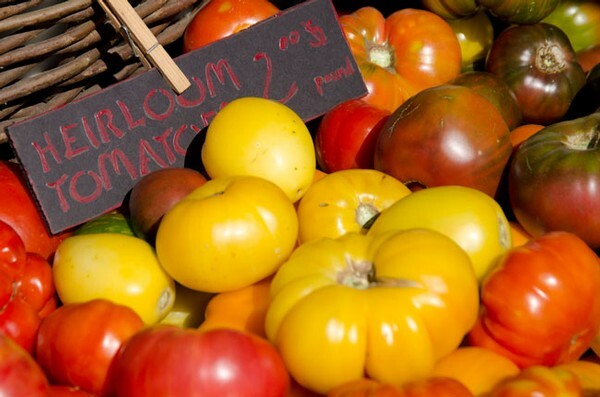 Best summer event in the Okanagan? Julie: Anarchist Lookout above Osoyoos looking north or south on a clear day. Best Beach in the Okanagan? Best place for lunch with friends? Julie: Hillside Winery – have the duck confit sandwich! Most interesting tasting room experience at another winery? Julie: Church and State Winery – love that you get to sit and relax while you taste. Best Breakfast or Brunch in the valley? Best Fall Wine Festival Event to attend? Best kept secret about the Okanagan? Julie: All the talented chef’s we have in the valley. Let us know what your favorites are and if there are some other Okanagan secrets that we haven't thought of.